What a difference a drummer makes – especially if she's a girl. As Janet Weiss arriving from Sleater-Kinney improved Stephen Malkmus' band, The Jicks, so Leah Shapiro, of the Raveonettes, has wrought a mighty transformation of Black Rebel Motorcycle Club. Grounding the new album in a terrific, rumbling groove, she allows the songs to breathe, always adding just the right presence on what is the BRMC's best album since their eponymous debut. Robert Levon Been and Peter Hayes supply the familiar shimmering guitars and plaintive vocals and the range of songs encompasses everything from all-out rock to the alt-country twist previously featured on third album 'Howl'. But underneath is a rock-steady beat which is both solid and perfect. The album is supposed to have taken longer to put together than recent BRMC efforts and the songs benefit from an attention to detail and form. Opener, impressive title track 'Beat the Devil's Tattoo' sets the tone – dark and sticky – and there are plenty of highlights to follow from the heartfelt and lyrical 'The Toll' to the extended rock-out of 'Half-State'. Anyone can play guitar, as the song goes, but not everyone can make six studio albums and deliver their sixth as thoughtful and creative as this album. 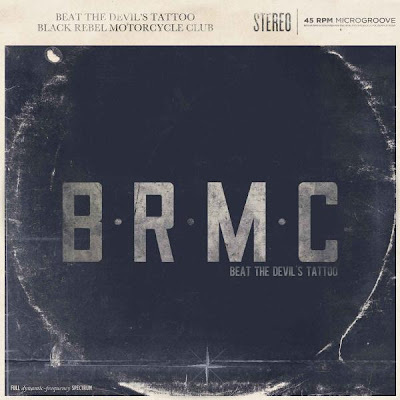 BRMC have proved they are very much still a force to be reckoned with and their mix of old hands and a new recruit is a potent one. Live shows should be a treat. 'Beat The Devil's Tattoo' is out now. Download 'Conscience Killer' from the album here. Stream the album at we7.